This Truck with a Power Stroke Diesel is one of many nice things that'll hit the auction block! S.A.N.E. Benefit Trail Ride Day One, LIVINGSTON, June 13, 2008 - Friday the 13th has never been funner. Camps are set up, folks are eating, music is playing, and the smell of barbecue filled the air. Tonight will be the big concert that'll be complete with big dance, auction, barbecue brisket, sausage, chicken, corn on the cob. PolkCountyToday.com will be there to cover the festivities. It's not too late to make it out tonight for all the fun. There is a $5 cover charge for the show. 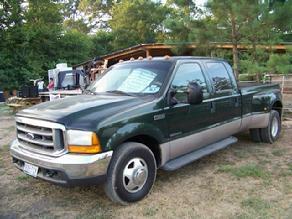 The auction will be featuring a late model Ford dually truck with a power stroke diesel engine. There's so much going on that there's more than I have time to list. Don't forget, there's lots of door prizes to be given out. Come on out, bring the kids and have a good 'ol time!